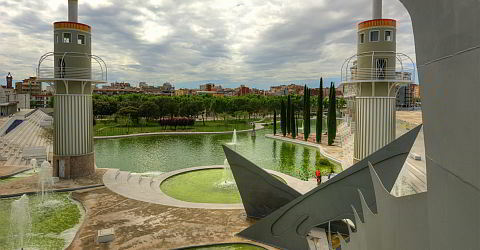 The Parc de L'Espanya Industrial was designed in 1985 by architect Luis Peña Ganchegui and Francesc Rius. Alluding to the Roman baths it offers the park a lot of greenery next to a small artificial lake from which boat trips are possible. The iron "Dragon of St. George" at the northwest corner of the park has been established as the most popular slide with the children. About the park are distributed some various sculptures. If you arrive by plane or by train on the Barcelona Sants train station, why not use the park for a short break. It is just 100 meters from the station. The most striking sign of recognition of former factory built parks are the "lighthouses" threaded around the lake. The park is located on the southern side of the main railway station Sants. Hardly a plant in Barcelona polarizes as much as the Parc de L'Espanya Industrial. Some find the postmodern park cold and with little atmosphere, others find it a successful blend of modern architecture, modern art and place of recreation. Both groups are somehow right. Despite these controversies which trigger the park, the people like to use it, also because of no alternatives in this area of Barcelona. After reopening after reconstruction works the Parc de l'Espanya Industrial is a wonderful place to wait for your train instead of waiting in the stations lobby.